Tart cherries are a major crop in Michigan, with the state producing between 70% and 75% of the national supply. Traditionally crops on mature trees are harvested with large shakers. 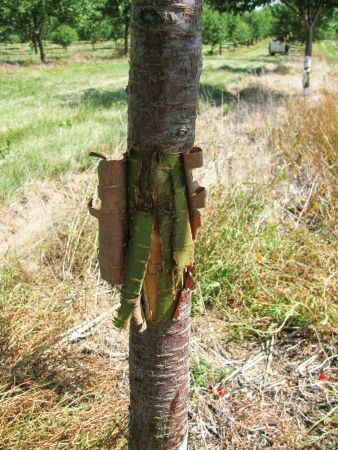 Although trees begin producing fruit in the second or third growing season, growers have to wait a few more years until the tree is able to sustain trunk shaking. But, what if the fruits produced in those early years could be harvested? Early returns on investments are something preached about in other tree fruit commodity circles. What if tart cherry growers could experience such benefits as well? 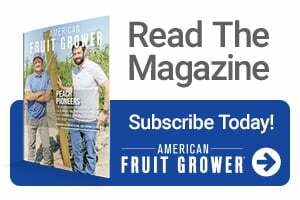 That’s exactly what Phil Korson, President of the Cherry Marketing Institute, wondered when he visited Poland about 15 years ago and saw cherries being harvested with over-the-row equipment. So as Ron Perry, Professor of Horticulture at Michigan State University (MSU), returned to research from his stint as department chair, he was encouraged by Korson and others in the tart cherry industry to explore different mechanization options. Tree shakers are an expensive investment, which many tart cherry growers already own. There is some hesitation to transition from current growing systems to modern orchard systems. However, efficient as the current system and harvesters are, trees can only sustain so much from shaking before losing production. Growers also can experience losses due to soft or crushed fruit. One estimate says fruit damage resulted in an average $6 million loss since 1990. Not to mention, growers wait until the tree is strong enough before they can harvest – missing out on early year production. Economic viability is something those in the tart cherry industry are increasingly examining. 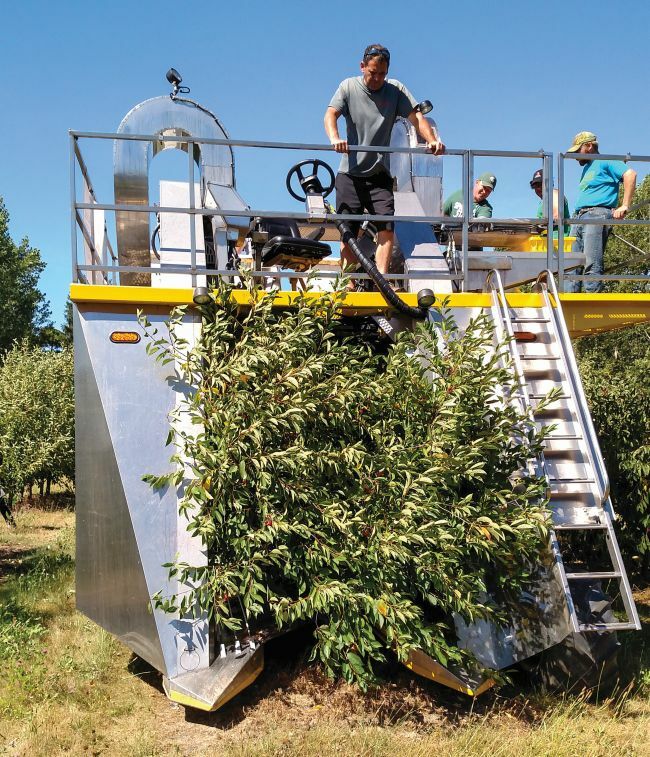 The focus is on how to prevent fruit damage and get early returns, which is where high-density orchards and mechanical over-the-row harvesters enter the equation. “The return on investment should be much quicker because we will harvest fruit at a much younger age,” Korson says. There are costs with moving to a high-density orchard, Perry says. In traditional systems, trees are planted 15 feet apart, and a new high-density planting will mean more trees per acre. Growers with a double-incline harvester would be able to make the switch to a high-density system much easier, Perry says. However, the end goal of high-density orchards is to get returns in the third leaf and payback much quicker. Perry and his research team began trialing berry harvesters with rotary tines at the recommendation of researchers in Serbia and Poland. Perry’s team demoed an Oxbo 7264 in 2008, an Oxbo 9000 in 2009, a BEI 3000 in 2010, and a Littau ORXL harvester in 2015. Perry says they are still studying which systems work best for the rotary tine harvesters. With only five years into the project there is still a lot Perry and his research team has to learn. However, there are two different approaches being examined closely: tall spindle, high-density systems and a low bush hedge canopy to fit current rotary tine berry harvesters. Tall trees will not work with the current rotary tine berry harvesters available. For now, Perry feels this is the best path forward with the current rotary tine berry harvesters. He says the tunnel dimensions for which the trees pass through is 4-feet-by-8-feet. 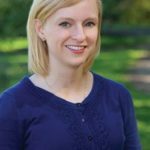 Christina Herrick is the Senior Editor of American Fruit Grower® magazine, published by Meister Media Worldwide. See all author stories here.